I'm sorry I've been away so long. I'll fill you in as I go along in later updates, but for now I want to get this word out. John Marshall has been holding an online fabric sale. It's ending this week, so to get beautiful silk on bolts or in pieces, yukata, shawls, and on and on, please go to www.JohnMarshall.to and click on the sale icon. John has instructions on how to order and pay. I'd show you what I'd bought, but I'm saving it for myself for Christmas. It's a ten yard bolt of narrow blue silk with an allover leaf pattern in white. Beautiful graphic. The other reason to hurry on my part, is that Suzanne Silk (Perilman) is having a trunk show and sale on December 11, 2010 at On the Vine in St. Helena, CA. 1234 Main St., St. Helena, CA 707-963-2209 Suzanne will have her signature kimono jackets, shawls and scarves on display and for sale. 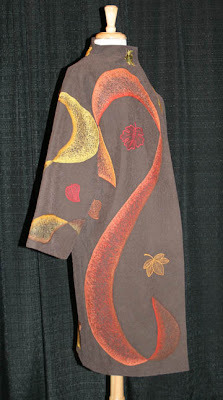 These are beautifully silk-screened and painted silk garments. 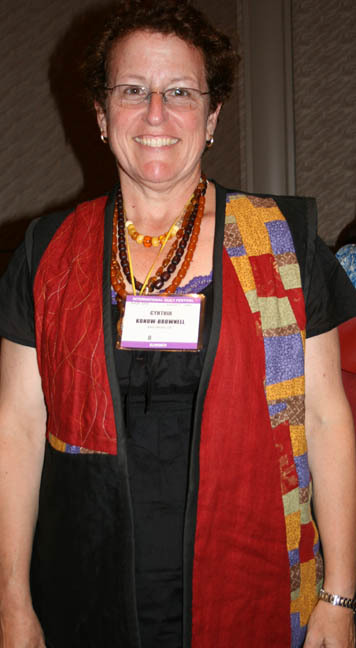 Suzanne's work has appeared in many magazines and books, among them Fiberarts magazine. 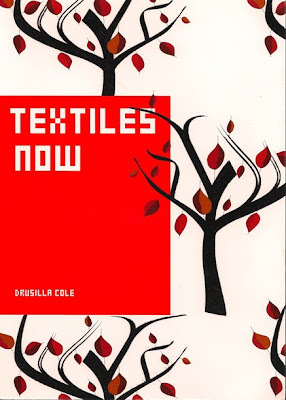 She appears in a new book just out here: Textiles Now. Drusilla Cole. Laurence King Publishing, London, 2008. www.laurenceking.co.uk The book is available at Amazon.com as well. Briefly, the book features photos of the work of textile artists from all over the world. It displays some wearable art but that's not the central focus. 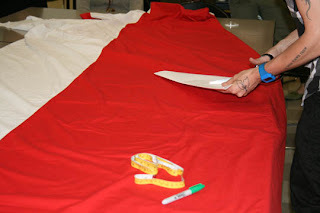 Many, many of the techniques used in art pieces would be an exciting and interesting feature on a garment. Very inspiring. More later...check it out. Then for something a little different. Destiny Carter & Margot Silk Forest of Sassy Feet have painted a boot for Christmas: T'was the Night Before Christmas Boot which you can see at the Jacquard Products website complete with instructions. Dressing Beautifully, Creatively, for Ourselves! For my niece's wedding I really stepped out of the box! Some time back, I showed you the results of the class I took with Julian Roberts. So many people encouraged me to wear that dress for the wedding, that I just had to make it again. In an attempt to control where two fabrics would appear together, I sewed the pieces together differently and totally outwitted myself. I still wasn't familiar with the twists that come with the first cuts, and so I ended up with all one fabric in front, and all the other fabric in back. Oops! Meanwhile I was struggling to finish the wedding presents and mom's wedding outfit. So I hung the dress on my dressform and studied it from afar as I worked on other things. I just wasn't ready for more surprises—I knew the look I wanted, so I abandoned Julian's technique at the last minute, after the first set of holes. 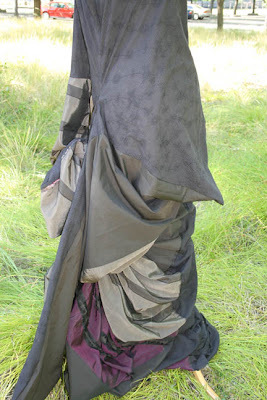 I loved the draping back which reminded me of 1800's fashion. 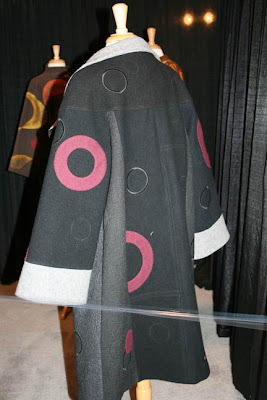 I had tucked in the pointed center which had made it look like something from Issey Miyake. I made a lining that was much shorter than the dress. then I stitched the hem of the dress to that lining. This created an asymmetrical hem that wasn't planned but happened because I didn't stitch the entire hem evenly to the entire lining. I was sewing at the eleventh hour so this had to be quick and dirty. 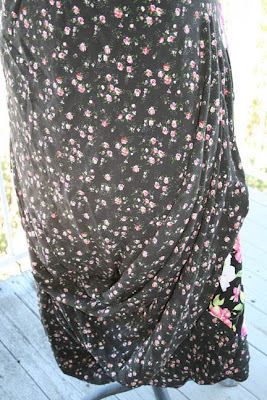 It also created a balloon hem which I rather liked. Voila, a gown for the wedding. Watching the reactions of people to the real thing, it has more going for it than I thought. Those who don't like or aren't used to the avant garde, don't like this dress. But I've discovered that most people are taken by it. I'm not going to show you the dress with me in it. I looked like a windblown floral barrel after racing for three hours to get to this wedding. Apologies for photographing without pressing the dress again. My dog Paloma loves the feel of the rayon challis and likes to sleep on it. But mainly you'll see how I combined two fabrics. I had made mom a silk ensemble. 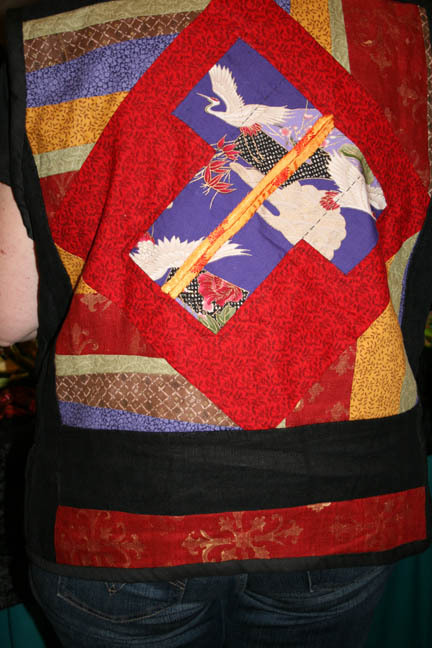 She had a hand-painted silk charmeuse blouse I customized to what she wanted. I used a Connie Crawford blouse pattern (Butterick patterns) and as usual it fit perfectly right out of the package, just like it always does for me too. The skirt was purple silk noil, long, narrow, one seam and gathered at the top. The "blender" was a hand-dyed silk chiffon scarf where the dye had been treated with salt (gives a texture to the dye). The scarf was emerald green with royal blue spots. 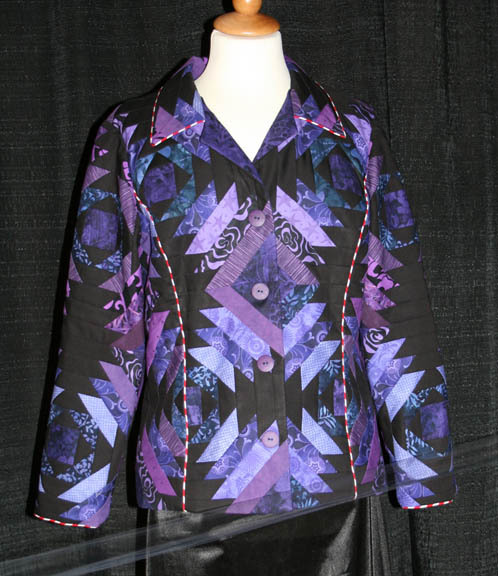 The blouse underneath echoed those colors but also had some orange and purple added. I just walked into Thai Silks, saw the chiffon on the sale rack and built the rest of the fabrics around it. I hope I get to see many of you at the Pacific International Quilt Festival in Santa Clara. I plan to be there Friday and maybe Saturday (birds will be at home alone so I'll need to dash off). First I photograph the wearable art exhibits. I still owe you the photos from last year, taken just before life fell apart. Then I take turns shopping and looking at quilt exhibits. I must visit Cherrywood Fabrics. I edited the Sweet Clover Canyon quilt pattern, Marmalade & Jam, last fall, and the Cherrywood version should be on display at this show. John Marshall will be in the Bohemian Element booth. He's bringing gold and metallic threads from Japan—I have to see these! 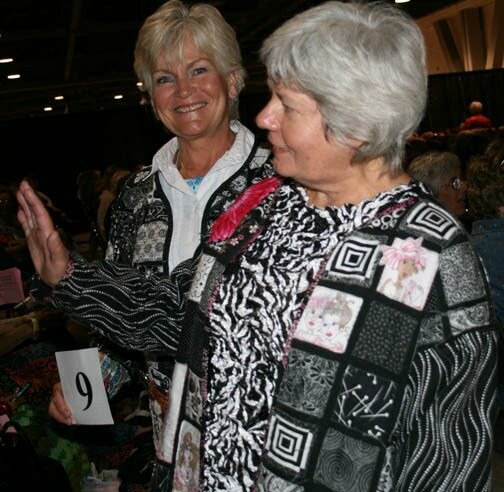 If you go to www.quiltfest.com you can see their list of vendors and exhibits. Kayla Kennington will be appearing in the fashion show Friday night and to me she's likely to be the star of the show, next to host, Karen Boutte, who always steals the show. Afterwards we usually retire to the bar in the hotel and discuss wearable art for awhile, so come on by and join us. 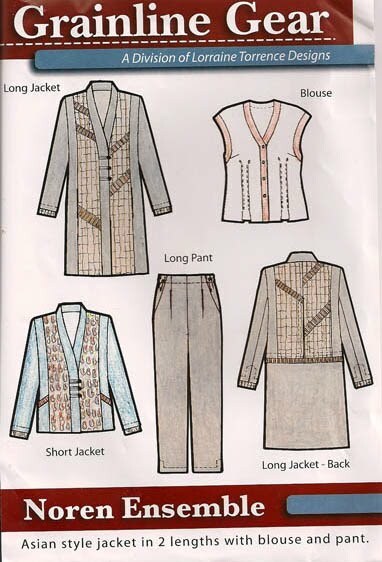 I must talk about Lorraine Torrence's Grainline Gear pattern that I described here some time back, the Noren Ensemble #1522. I went to her booth in Long Beach and saw the pattern made up. What I didn't know was the meaning of Noren which is the curtain over the door when you go to a Japanese restaurant. What I had missed entirely is that the back on the coat or jacket hangs loose like that curtain. In the drawing I thought it was a line across the hips that wasn't too flattering. But indeed, this is an overlay with a very interesting effect. I liked it much better once I saw the real thing. Lorraine will be at PIQF this coming weekend, so come see the coat for yourself. I also hadn't yet told you about her book of pamphlets about various embellishments. For example, how to enhance your garment with your choice of button or buttons. These pamphlets are also the basis of Lorraine's new DVD. There's something special about having the designer explain what she's doing. Even if you've heard it or read it before, there's a subtle added layer of information that comes from watching her. www.ninepatchmedia.com I will review these further another time, but please make sure you stop by her booth and see what I'm talking about. I also bought her wool felt for creating appliques on felted pieces. She has a sample garment and instructions. It's been an incredible morning online. Much creativity is blooming everywhere and people are sharing sources through Facebook. Today I first discovered Tzimora Salamon. There is no quick and easy way to describe Tzimora or her friend Debra and others. I will give you the url to go see for yourself. Tzimora explains so well how to "dress." She wears ethnic clothing that I covet. But it's also how she puts it all together—she's amazing—she says it's like doing a painting. www.youtube.com/watch?v=ey58QCTqf_s&NR=1 When you finish watching the video of Tzimora, watch those of Debra and others which should be listed next to the video. I had a kick out of watching Debra shopping at a second-hand store. I then read through the blog Advanced Style. It's a blog with great photos and more videos. I think you will love these as much as I do. You will also see the connection to wearable art. We need this sense of style, of having a certain panache, and of showing confidence, to wear some of the things we make. And also, seeing what Ilona Royce Smithkin and others wear will show you that you can be a work of art just with how you put together colors. 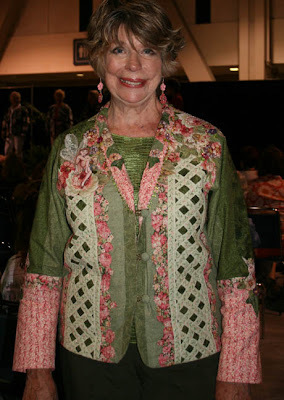 http://advancedstyle.blogspot.com/ These are senior citizens dressed beautifully. 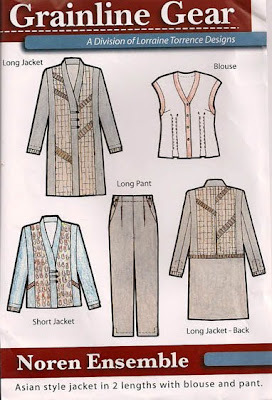 Remember Fred Bloebaum and La Fred patterns? Nick Coman sent word that designer Fred Bloebaum passed away on September 4, 2010. She'd been battling insidious cancer and, if anything, this brings an end to her suffering. But we will miss her spark among us. I always picture her as I knew her before she became La Fred. We met at The Sewing Workshop long ago where eventually she was teaching classes before starting the pattern company. The Sewing Workshop would have an Open House with fashion displays and sales on fabrics and buttons and such. We regulars were enticed to come by and see what was new and exciting. Fred was always there with her short, sleek dark red hair and sparkle. www.lafred.com/ I know there was a sale of everything in Fred's business so I can't tell you if you would receive any response to her website if you wanted to buy a pattern, but I think you might like to see the gallery. I have received word that family and friends are invited to celebrate her life on Friday, Sept 17, 1 pm at Plymouth United Church of Christ, 424 Monte Vista Avenue, Oakland, CA. Per Fred's request, please wear your favorite colors. 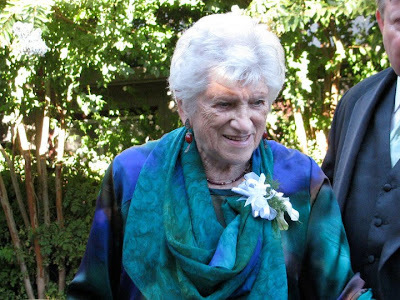 In lieu of flowers, donations may be made to Project Open Hand 730 Polk Street, San Francisco, CA and Sutter VNA Hospice, 1900 Powell St, Emeryville CA. We also lost Bonnie Leman, the founder of Quilter's Newsletter Magazine. She was one of the major sparks behind the resurgence of quiltmaking in the US. Her magazine continues in other hands, but she's the one who persevered with it for so many years at her kitchen table and brought the old skills to the fore. 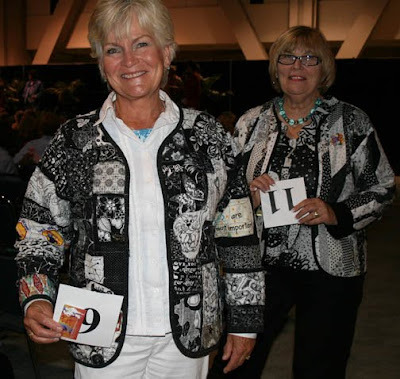 I'm back from the International Quilt Festival in Long Beach, rejuvenated, happy to have been with friends, and also very happy that I went to David Taylor's lecture and to Saturday Sampler. David Taylor is a quilter with a style all his own. www.davidtaylorquilts.com This has nothing to do with wearable art except that he kept talking about how his quilting has gotten more and more dense. 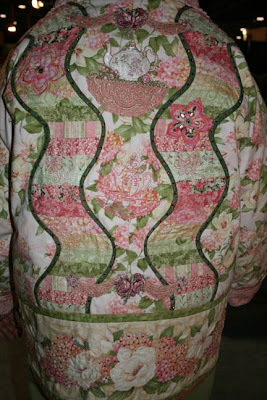 I thought that was a good concept for quilted clothing. 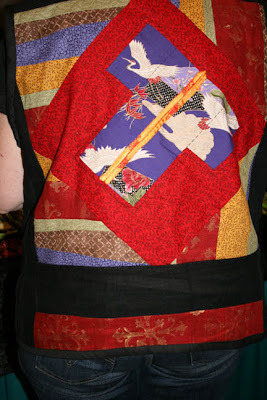 The more quilting, the stiffer the fabric, but on the other hand, I like the look of a garment that has complex quilting. In other words the quilting becomes more texture than design. You just have to allow for the stiffness through the garment shape you choose, and/or judicious placement of quilted areas. You don't have to quilt from edge to edge. As for Saturday Sampler, that's where I met Glennis Dolce whose comments I've been reading on Facebook. It's always good to hear the thoughts and frustrations of an artist and to know she's having the same problems you are, so that's why the Facebook comments are so interesting. Glennis calls herself the Shibori Girl because she does a lot of shibori dyeing. Go to her blog to see a video of her booth in Long Beach http://shiborigirl.wordpress.com/ and what she has for sale. 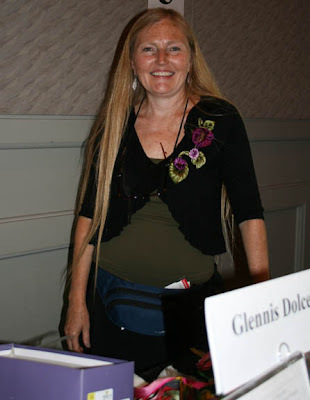 She pleats up silk pieces and dyes them, then sells them as ribbons and the basic components of soft flowers you can wear, among other ideas (in the photo Glennis is wearing her flowers on her shoulder). 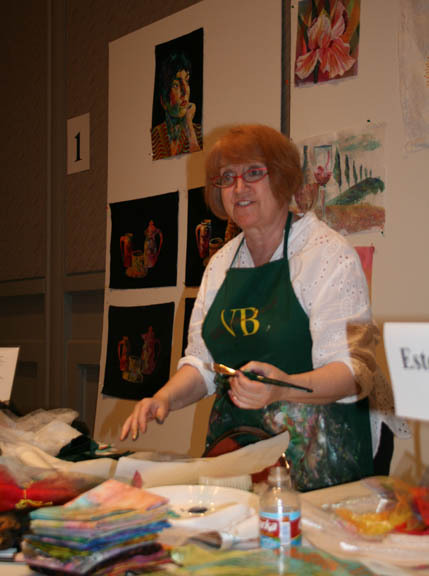 I sat in on her lecture at the Saturday Sampler to see how she creates her flowers. They're pretty and soft and many of you would likely want to try this. She also had pieces of her indigo-dyed fabrics which interested me most. A big draw for me in that booth was to see up-close the quilted collages made by Jude Hill. I'm one of Jude's fans because I love hand embroidery and especially the way she uses it—I study her work on Facebook—but she also has a website and a "what if" blog. http://spiritcloth.typepad.com/what_if/ http://spiritcloth.typepad.com/what_if/ This blog is so inspiring to me because it reminds me to try little things. 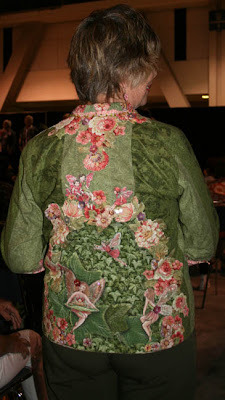 It doesn't have to be a huge experiment, I can do some little work on a corner of a jacket, try a little paint, use a different stitch, and voila, it will get noticed. I have a store-bought denim jacket that I never wear because it needs embellishment. But I didn't want it to look like what everyone else makes with little bits of lace and charms and yo-yos, or appliques, that sort of thing. Since I admire Jude's collages so much, I thought that's what I'll put on my denim jacket. I'll use the packet of Glennis Dolce's indigo pieces which are cut and ready for me to test my layout and embroidery skills. A few more words about Saturday Sampler. If you're not familiar with this event, a number of teachers are set up with mini classrooms around a big room. You move from one teacher to the next as they give a short lecture. I love to go to these because you can get up close to some very famous teachers with wonderful techniques. You get a taste of their lecture style, you get a view of that person's personality, and usually you can buy their book or products. This time I met Esterita Austin. 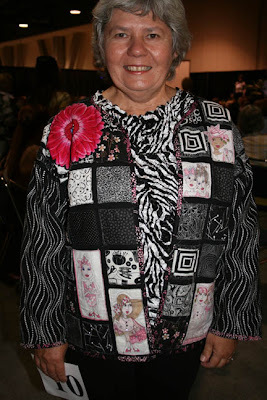 I wasn't a fan of her rocks quilts and was surprised when friends told me how much they enjoyed her classes. Well, five minutes with Esterita and I'm a convert! She's funny, she's innovative, and she knows what she's doing with all kinds of techniques. There were several others I will tell you about another time. I Shopped, No Books, etc. Did I shop at the show? You bet, I really helped the economy because I haven't been to an IQA show in four years, but it was different. So many favorite vendors were missing—Treadleart books is always my most important stop and they weren't there. 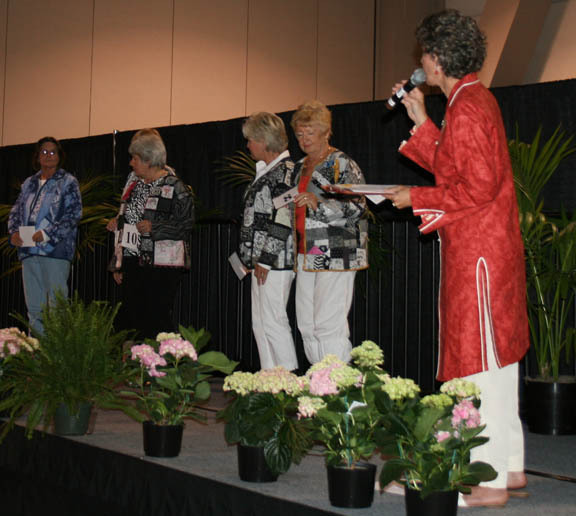 The only garment patterns booths were those of Lorraine Torrence and Saf-T-Pockets. Not that I'm complaining, those are two special companies, but in the land of southern California where there's a large wearable arts group www.wearableartconnection.org/, why weren't there more vendors with garment patterns and more products that would be of interest to them. I have no doubt with the economy, many vendors couldn't afford to pay to go and also risk losing more if the customers weren't there. But I'm wishing it weren't so. Why wasn't the Wearable Art Connection represented? Why wasn't there an exhibit of the fabulous clothes they have? I know Justine Limpus Parish was busy with a sale at the Palos Verdes art gallery. But she's one of many designers who live in the area. So on that level I was really disappointed. I took photos of the only garments I found in the exhibits. 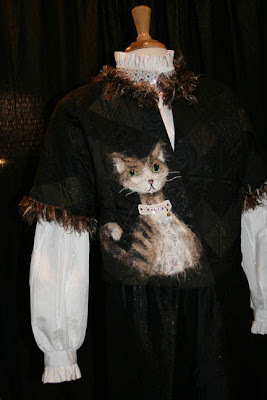 I know Judy Mullen made the kitty-cat jacket, but I'm sorry, I didn't record the names of the other artists. If you know who they are, please send me a comment so I can give them credit. 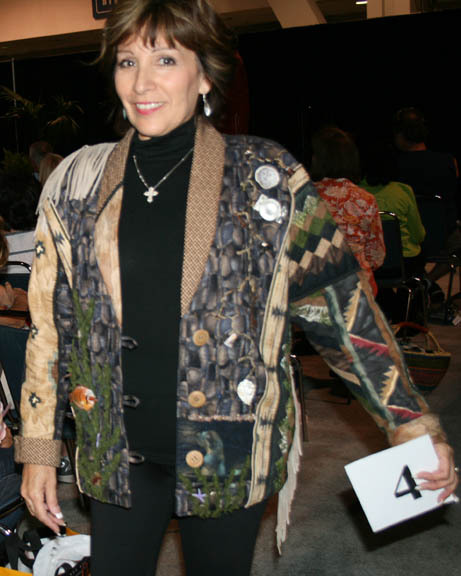 The pieced jacket was part of an exhibit of pineapple block quilts. There is something else. Strictly on the level of quilt exhibits, we (meaning various people I talked to) felt the lack of a superior quality. The SAQA exhibit was worth seeing for the great variety of ideas and techniques. But the entire IQA show as a whole fell flat, there was little to excite and stimulate. Nothing stood out for me and so said the others. I thought maybe I was feeling some ennui. This was my first big show since my husband died, the drive itself was a big event, and I wasn't yet geared to creative interests. But I don't think it was just me. Something was missing from making this a fabulous show and someone thought it was the competitive aspect. No one was striving to win first place, and likely these shows weren't juried, so we got interesting pieces but nothing spectacular. I was thrilled to find that they had arranged a one hour runway show for Saturday afternoon in Long Beach. It turned out to be lackadaisical or maybe the word is lackluster. 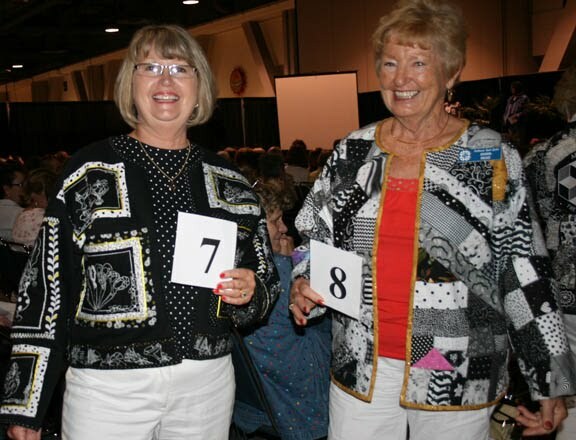 When the person running the show proudly explained that she had embellished her long vest with Steam-a-seam® gold tape which she had ironed in a long line around the openings, what could I do but groan? This they present as an example of wearable art? She then brought out another person who works in the background at the show, explained that she doesn't sew either, but had crafted a jacket from scraps. I didn't get a close look. 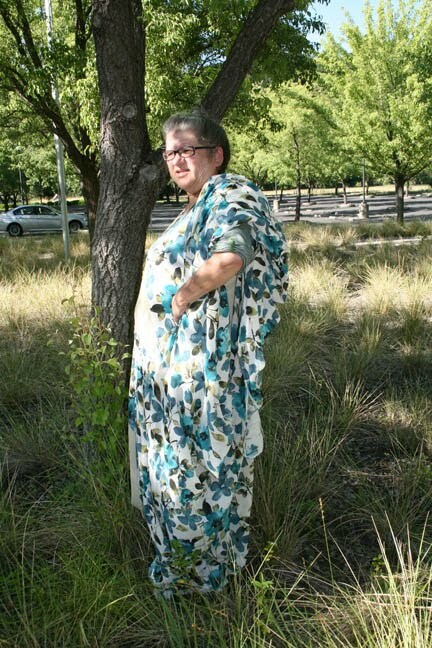 I'm sorry, but beginning sewing doesn't come close to a competition-winning work of wearable art. The amount of work involved is far and away beyond what a beginner could conceive of and I wouldn't want anyone to have the impression that a bit of embellishment is all it takes. This fashion show was over in 35 minutes. I think they were gearing this for quilters who don't make clothes, trying to encourage them to try it. I heard one older lady say, "That was interesting." It was, briefly, as you can see in these photos. But it was just a start; just a bit of representation of wearable art. Not really enough to get fingers tingling and juices flowing, and making people rush to their machines. By All Means Plan to go to Long Beach! All that said, would I encourage you to go to the show in Long Beach? Yes, because it's still very new and evolving. I was told they will no longer put on the fashion show based on the Stitch-in-Time show from Houston—so this was just a lame finish. It wasn't clear if they would have any wearable art displays next year. I imagine the cost of insurance for these garments continues to be prohibitive and people don't show enough interest. But I do think we could find willing local designers who would share their work—at least I'm wishing it were so. 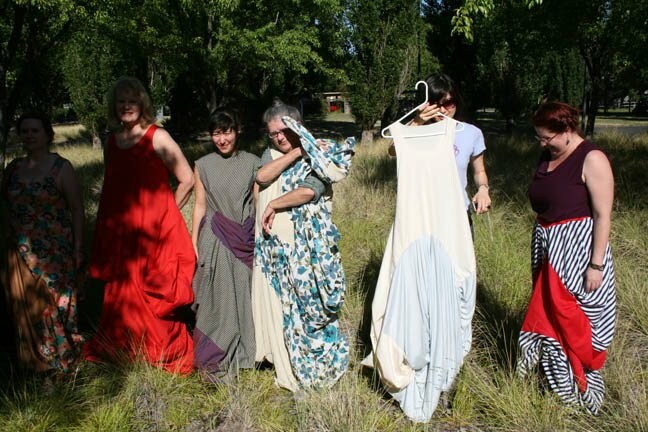 The wearable art group in Los Angeles is heady with skilled garment artists. Let's give them an exhibit or even a fashion show. If they can do it for local art galleries, why not for the IQA show? That would give us something really worth seeing! If you have any new ideas for something to replace the Bernina shows in Houston (maybe on a limited budget), and what might work in Long Beach, please let me know. I can put you in touch with the people who want to hear it. By the way, I also took photos of passersby who were wearing something interesting. I Love Serendipity—the fortuitous discoveries! Today I went to photograph my dress so I could show you details up close. I stopped to take a picture of my bird Dolly and then the camera went silent. The battery had run out and I hadn't noticed. Why serendipity? Because usually my batteries would die in the middle of my photographing the Fairfield or Bernina fashion shows! I'm about to travel and might have left with a dead battery! It's charging as I speak. I was photographing a lot lately. Mom turned 90 and I threw her a birthday party. So instead of the dress, here's mom! That's neighbor Trinity with her. 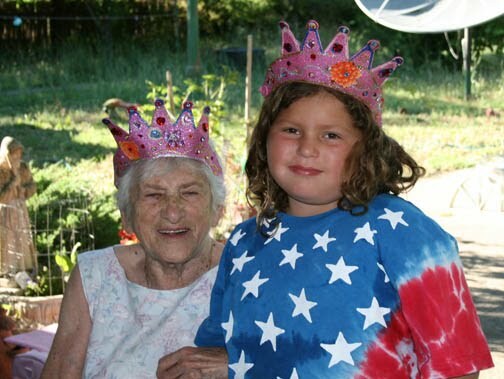 Mom was Queen for the day, and Trinity was princess of July Fourth. Trinity and her brothers decorated the pink foam tiaras using glitter glue, crystals, buttons, fussy-cut fabric flowers, and beads. The sparkle was wonderful! Then someone chose not to bring the birthday cake after all, so I proved my love of color with the strawberry pizza I'd made (recipe on Google) and fortunately I'd found birthday candles on toothpicks. Came out great! 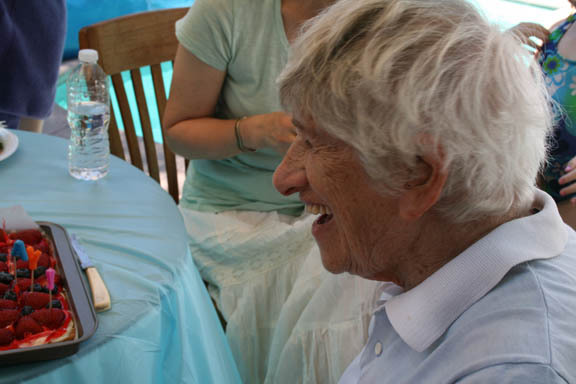 Best, happiest, unposed picture I've ever taken of mom. The store sign was made in secret by her next door neighbor Mike who is so sensitive to her needs. 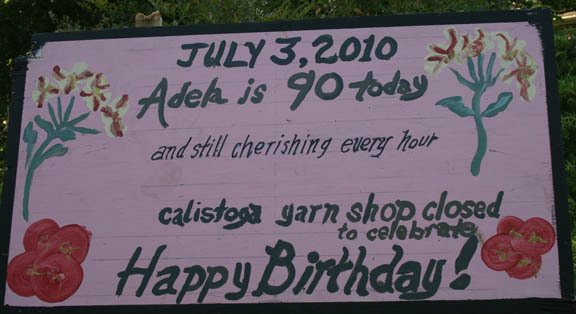 Now just come visit her store at 1610 Cedar St. in Calistoga to make her even happier. She gives knitting and crochet lessons too. Two weeks ago I took a class with Julian Roberts. Do you remember me mentioning him last year? He's the English designer/professor/rebellious person who has designed a new way of sewing clothes. These are clothes that look something like Issey Miyake, Commes des Garcons, and Rei Kawakubo styles. I knew from the get-go that this wasn't anything I would wear, but I went because I'd been craving to be among people who know what a seam allowance is. Leslie Gelber and Diane Ericson were in class among many others I've gotten to know over the years. Julianne, for example, won a Threads competition in the last year—see more information below. We listened to the introduction to this one technique—he has others described in his new book, School of Subtraction Cutting, available for $60 at the Center for Pattern Design: http://www.centerforpatterndesign.org/. I haven't seen it yet but expect to get it. He also has patterns available—he shows you how he has created specific dresses. I got a kick out of Julian because he's a slim, slight "chap" with an intense energy, very kinetic, and dresses like the "rockers" did back when I was in England as the Beatles were becoming famous—very pointy shoes, slim pants, close-fitting shirt. He creates videos, does graphics, builds websites and then puts out fashion lines and teaches us his techniques. The whole time he's teaching, he has one of his fashion videos running in the background. Wouldn't that be distracting? Not to him, he's of that age where they're used to all the technology and noise. If anything, it made us focus on him that much more. I had bought a piece of cotton gauze at Walmart, figuring it wouldn't be much to lose and maybe it was something I could give mom. I had picked something heavier as the second material. But as I was about to leave the house, I saw the putty-colored lining fabric I've had lying around for years, to snip off as needed. I regularly will buy something like that for quick experiments or as an interlining. I complicated the process by having one piece longer than the other. In the end, that circumstance added interest to the garment. I don't want to give the technique away though. As a demonstration, in about two hours Julian cut and sewed up a new dress from what looked like two pieces of cotton, one red, one white. OK, so here he is using his circle technique. Nothing too complicated—you start with your own tanktop pattern then sew edges of two holes together and continue in this way. In the end you have to figure out where's the path for your body to enter the garment. Julian had to help me with mine because I had something like the floating buttresses holding up Chartres cathedral inside my dress. There's just a lot of twists and turns that you don't see on the outside. I put it on and I felt like a million bucks. There are torn holes in the lining fabric, the design features start too low and show off the worst of my body, but I felt like a princess. When I looked at all of us in our gowns, I felt like we were in the wild, wild west—the gowns women wore in saloons, or something contemporary from Japan. Certainly they have the feel of something out of the 1800's and yet are totally avant garde. I just fished mine out and put it on the dress form and the top looks like flapper twenties, but that's because my design started too low and I didn't sew in bust darts. I also want more happening in back so I have to figure out how to do it. These photos aren't flattering—I had put all the excess fabric on my shoulder trying to cover up that I was still wearing my t-shirt. So it looks like I'm wearing a sari. In future I'll show you how it looks with the excess removed. With the help of Julian's assistant, girlfriend, and fellow artist (a lovely girl), I got photos of the group of students. One of my favorite dresses is from two pieces of red cotton. See what you think. I'm sorry, I lost my record of names so have to go back and get them again. 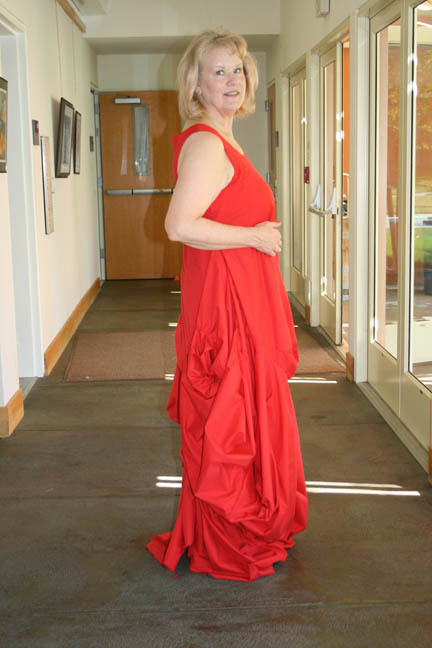 In the meantime, look at the "rose" on this red dress. My other favorite was this slim dress made from Japanese fabrics. Julian's desire was for us to catch the experimentation bug and to move out of our comfort zone—not just in this classroom but after we left it. Certainly his technique forces you to leave all rules of structured garment sewing behind. He sure got to me! One of my classmates insisted that I should wear the dress to my niece's wedding at the end of August. I've decided to make another one and see how it looks and feels. I'll be trying some "what ifs". 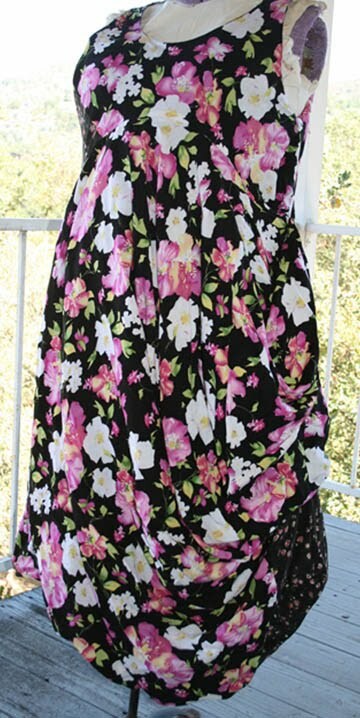 I've bought a black and pink floral challis and a rayon with much smaller flowers. 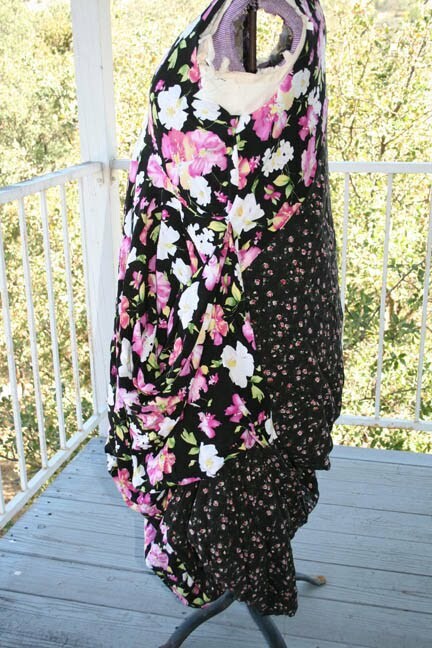 I thought the two worked off each other somewhat well—I doubt I could find a black rayon easily these days. I'll know better how I feel about that once I photograph them together. So here goes. Now I'll have to go out and buy new shoes—running shoes and clogs just don't go with the dress! I'll tell you one thing, this process makes me turn my back on working with patterns simply because I don't have to work with anything but my own sloper. There are no fitting issues below the bust. Julian Roberts did show us how to work with sleeves and pants. 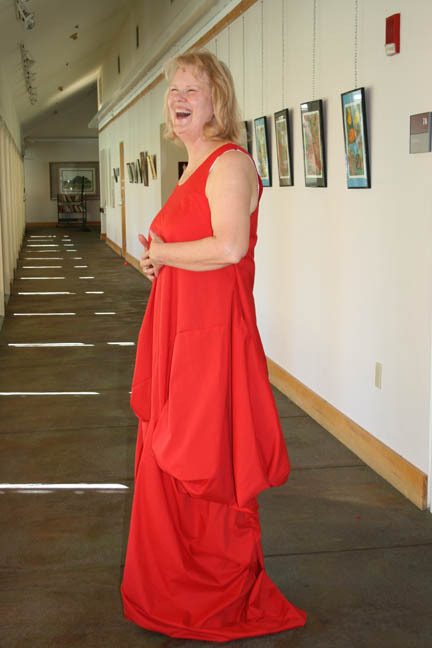 Leslie Gelber had brought in a dress she made after last year's class. It was completely out of net and stunning. My photos didn't do it justice. 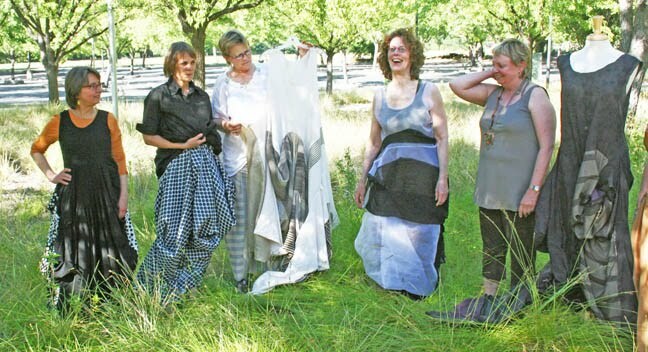 This time she made pants out of a stiff fabric so they weren't quite wearable, but we got the idea of what's involved. It really brought us back to basic shapes of clothing. 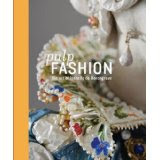 A tank dress, harem pants, and other shapes you will find in the book, Cut My Cote, or among ethnic Folkwear patterns. Now I want to stop talking and get to my cutting table and sewing machine. I have to sew up placemats but might just get started on the gown first. I'm busy adjusting my "sari" and that is Julianne on the right. I think she'd taken the class before so this time she made a skirt. Most attractive on her. That is Linda who makes buttons on the left. The person next to her with a black and silver item is Leslie Gelber with her pants. And then there's me. Oh drat, I forgot to resize the photo showing our backs. You'd see how the back of my dress is all blah lining but with interesting seaming. Another time. I asked Linda about her jewelry and whether she made buttons. Oh yes. The backs are finished in a different pattern from the front. These are part of the hydrangea series. She has a studio at the Art Explosion in the Mission area of San Francisco. If you'd like to contact Linda, please write to me in comments and I'll forward the message. Linda was in Julian's class—she's on the far left in the first group photo. Go to Julianne Batkin Bramson's website to be reminded of the gown that won her top prize at Threads magazine. (She designs patterns again, so do have a look.) http://www.fashioninharmony.com/ Note she will be a featured teacher at the American Sewing Expo in Novi and is appearing at the American Sewing Guild National Conference in Georgia. It’s going to one chic road trip according to TV News from People magazine, "Two of Project Runway‘s most memorable contestants—Austin Scarlett and Santino Rice—are heading to a small town near you for a new show on Lifetime". The show starts July 29 after Project Runway‘s season 8 premiere. It will follow the duo as they 'travel to and immerse themselves in the culture of small towns across America to create new, dream-come-true looks for special women in unique situations'. In the 14-episode series, Austin and Santino will face differences in opinion and demanding clients." Hope the focus stays on the designing and sewing and not the sturm und drung.